Maximum Power Point Tracking (MPPT) is a feature built into all grid tied solar inverters. In the simplest terms, this funky sounding feature ensures that your solar panels are always working at their maximum efficiency, no matter what the conditions. In fact, having a Multi Power Point Tracker will increase the amount of electricity that you get out of the solar panels by about 15% over the course of 1 year. If you are not keen to get all technical, then, no worries! Feel free to skip the rest of this page. But if you are interested in how a MPPT works, and would like to appreciate how clever they are then, please read on! How does Maximum Power Point Tracking squeeze more power out of your panels? A solar panel will generate different voltages depending on the conditions that the panel is exposed to. The amount of light shining on the panel. The load that the solar panel is pushing its electricity into. The temperature of the panel. So as you can see, throughout the day, as the weather changes, the voltage produced by the solar panel will be constantly shifting. 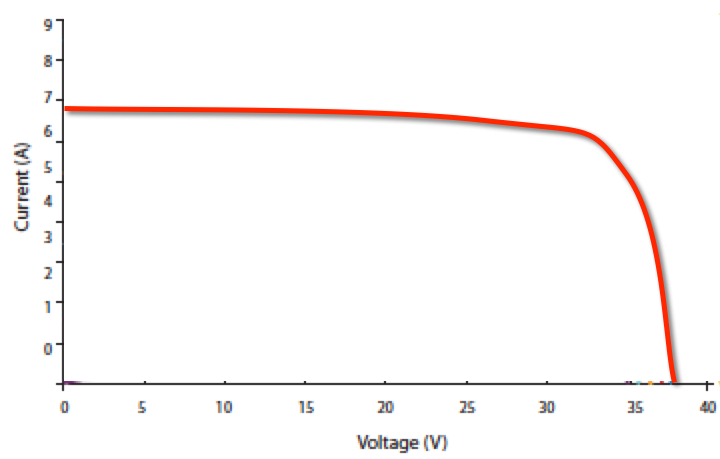 This graph shows you what the current flowing through a solar panel will be for any given voltage. 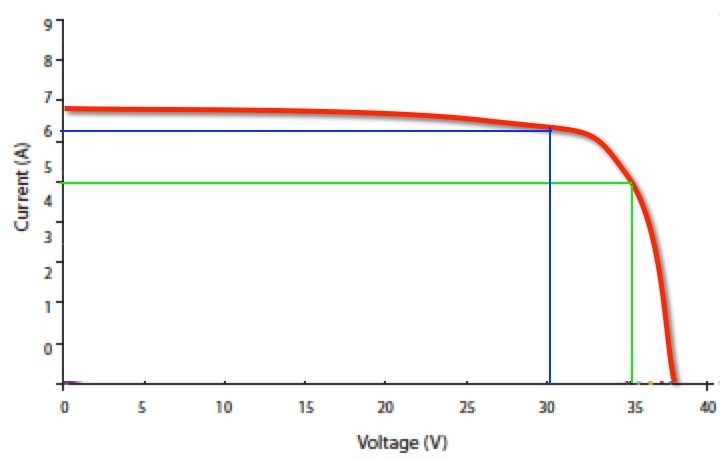 In the example below, the blue line shows a solar panel voltage of 30V corresponding to a Current of about 6.2A. The green line shows a Voltage of 35V corresponds to a current of 5A. What you may not have realized though is that as you move along the red curve above you will find one point where the Voltage multiplied by its corresponding Current is higher than anywhere else on the curve. This is called the solar panel's Maximum Power Point (MPP). In the example above the MPP is somewhere between where the blue line touches the red line and where the green line touches it. In fact (due to calculus for the tech heads amongst you) the MPP is always on the "bendiest" part of the curve. About 33V on the example above. So the job of a Maximum Power Point Tracker is to always operate the inverter on that MPP. For the example above that would be about 33V and 6A. The MPPT forces the solar inverter to work at 33V by varying the resistance of the inverter input using power electronics. The higher the resistance, the higher the voltage across the solar panel. But the MPPTs job is a lot harder than finding an MPP and forcing the solar panel to stay there by creating the correct resistance at the inverter input. 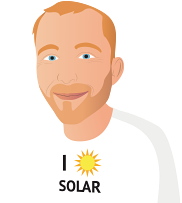 Remember that the voltage that the solar panel would like to work at is moving all the time as the temperature and solar irradiation changes. So the MPPT has to constantly adjust its settings to keep the solar panel at its MPP. It is chasing a constantly moving target. And to make the MPPTs job even harder, the actual shape of the IV curve is actually changing all the time, which means that the rules of the "find the MPP" game are constantly changing! 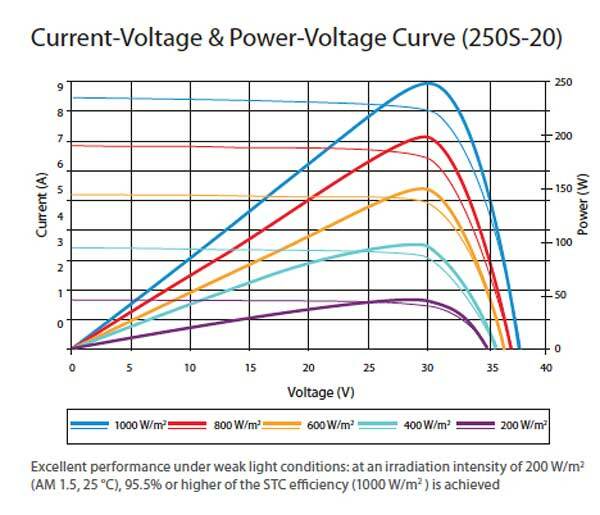 Here's an example of an IV curve from a Suntech panel. You can see that it has multiple curves depending on the amount of sunlight falling on the panel. This graph has also got the corresponding power curves superimposed on the IV curves. The power curves are the thicker ones shaped like a lopsided mountain. The top of the mountain is the Maximum Power Point. Now bear in mind that these are just 5 curves at 5 different irradiations and a panel temperature of 25ËšC. There are actually an infinite number of curves. What I'm trying to get at is that the electronics and software in a modern solar inverter are phenomenally sophisticated. It really is a marvel of modern engineering. And when you take into account that a modern MPPT will have a "MPPT efficiency" of well over 99% (i.e. it will always get to within 1% of the theoretical maximum), then you begin to appreciate how sophisticated a modern MPPT is. I reckon they are pretty cool. Now you (hopefully) appreciate how a Maximum Power Point Tracker works, you should be able to appreciate when there is a need for a solar inverter with more than one MPPT. You need multiple MPPTs if you have your solar panels mounted across multiple roof areas, and each roof area points in a different direction. This is because you each string will have different amounts of sun falling on it due to their different directions, therefore they will have different shape IV curves, and different max power points. So you need an MPPT for each string to get maximum performance from your system as a whole. I've written a blog post where I go in to a lot more detail about multi MPPT inverters and when you need them. A hosepipe analogy for the non-electrically minded! Finally – if I have lost you with all the talk of voltages, currents and IV curves, then it may help to think of an MPPT as analogous to placing your thumb over the end of a hosepipe in your garden. Please bear with me on this one! Imagine that you have a simple hosepipe. You have a steady stream of water gently pouring out and you want to maximize the power of that water so you can hit your spouse sunbathing at the other end of the garden. How do you do it? Simple – you put your finger over the end of the hosepipe to reduce the size of the hole. If you put too much finger over the end of the hosepipe you just get a fine mist of water – i.e. very little power. If don't put enough finger over the end of the hosepipe, the water won't go far enough. There is a "maximum" power point where you can get the water to spray a great distance without misting. That is what an MPPT does to maximize the power out of your panels – except it changes the electrical resistance of the inverter to maximize the electrical power. Now if someone were to open up the tap, you may find that you have to adjust the finger to keep your jet of water from becoming a mist, and vice-versa, just as the MPPT in your inverter has to constantly adjust the resistance as the strength of the sun varies, or a cloud passes. So there's my hosepipe analogy for how Maximum Power Point Tracking works. How did I do?